B 24DSA 42-40530 shot down at Vognbjerg near Skjern on 7/5-1944. T/o Harrington 22:03 Op: SOE to drop zone ”Stefan” near Rugård on the island of Fyn. After having dropped 12 containers on the drop zone “Stefan” near Rugård on the island of Fyn the B 24 turned west. In the vicinity of Borris it was attached from beneath by a Bf 110G-4 night fighter piloted by Fw. Hugo Fütscher of 12. /NJG 3. At 02:35 hours the B 24 crashed in a field at Vognbjerg to the north of Skjern. Front left: Unknown, Unknown, Gallozzi, Helmer, Unknown, Wengert. 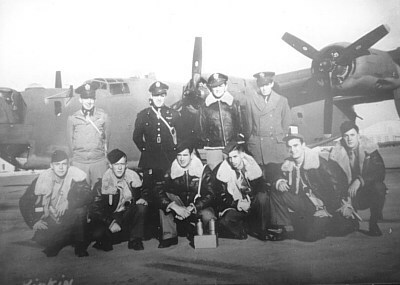 The crew of the B 24 consisting of Pilot Lt George Pipkin, Second pilot 2.Lt Israel ( Mackey) Barron, Bombardier 2.Lt Floyd Holmes, Tail gunner S/Sgt James McCaskey, Right Waist gunner S/Sgt Vincent Gallozzi, Top turret gunner T/Sgt Dale Helmer, Radio Op. T/Sgt Jack C. Wengert all managed to parachute to safety. 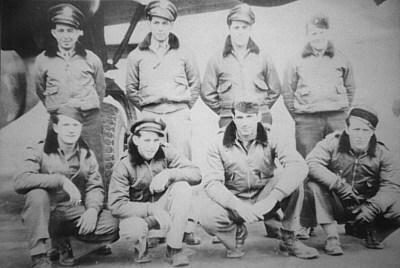 Navigator 2.LT Clair D. Vander Schaaf also bailed out, and was found lying in a field with a broken skull not far from the crash site. Apparently his parachute had not deployed properly. The body was found by a local farmer and taken to the hospital in Tarm from where it was picked up by a Danish haulage contractor together with a German Unteroffizier and a Danish helper. The body was thrown in the back of the truck and taken to the Krankenrevier at Fliegerhorst Rom near Lemvig. On 8/5 Grave digger Klaussen of Lemvig cemetery received a telephone call from Interpreter Jörgensen of Fliegerhorst Rom who requested that a grave was prepared for the next day. On 9/5 at 17:00 hours a truck driven by the Danish haulage contractor along with a German Undteroffizier and two helpers arrived with the body of Vander Schaaf. The body was not placed in a coffin but was without any ceremony rolled down in the grave after that the contractor had removed Varder Schaaf`s wedding ring for his own purpose. It had been decided by Hauptmann Holzapfel of Fliegerhorst Rom that there was to be no coffin and no ceremony. The grave was then left open only covered with planks until 12/5 when Reverend Carl Lund received permission from the city commandant to fill up the grave. 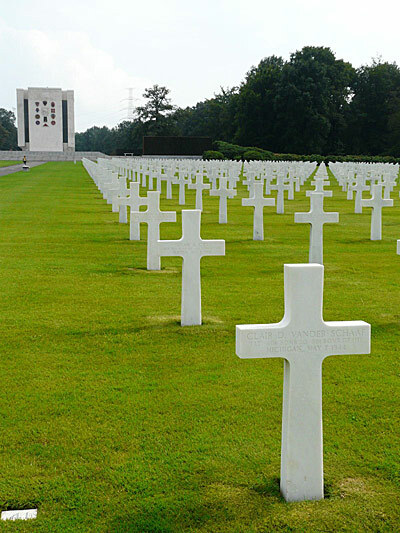 This was done on 12/5 1944 at 16:00 hours without any graveside ceremony as this had been forbidden by the Germans. On May 4. 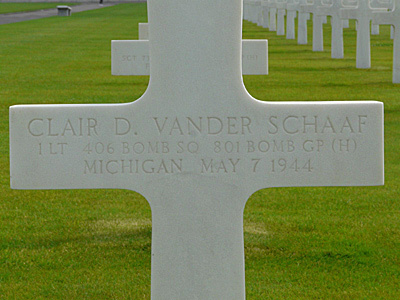 1948 the remains of Vander Schaaf was transferred to the American Cemetery in the Ardennes in Belgium where he rest today. Barron hit the empennage when bailing out and damaged his right arm and leg. He entered a stable and sat down and rested. When dawn came a man came to the stable and Barron asked him for help, but he was afraid and told Barron to move towards the railroad. Barron managed to get to the railroad and was picked up by a man riding a hand car. Barron fainted and was taken to a small yellow house next to the railroad. He was helped in the house and a doctor was called. The doctor was however not able to help as the telephone was tapped by the Germans. Shortly after, Barron was arrested by the Wehrmacht and taken to their headquarter in Skjern. Later he was put on the bed of a truck and taken to Fliegerhorst Grove. He was treated for his wounds in the hospital in nearby Herning. Pipkin, McCaskey, Gallozzi, and Helmer were captured by the Germans on 7/5 and also send to Grove airfield and later to Dulag Luft. They all ended up in Stalag Luft III Sagan. Holmes and Wengert had more luck. They knocked on the door to a level-crossing keeper house to the east of Skjern and were welcomed. Later they were sent to the vicar in Stauning. He in turn contacted Vicar Bork Hansen in Lönborg who was active in the underground movement. The flyers were picked up by the resistance leader Tolstrup and taken to Holstebro where they were hidden in the home of Baker Børge and Thora Larsen. Possibly on 12/5 they were taken to Salling where they entered the boat ”Mathilde” and were sailed through the Limfjorden and subsequent to Sweden where they arrived on 27/5. Front left: Wengit, Helmer, Gallozzi, Mccaskey. Sources : LBUK, MACR, UA, Kim Juhler, DFEV, “Mackey” Barron via Kim Juhler.